Casino Royale introduces James Bond before he holds his licence to kill. But Bond is no less dangerous, and with two professional assassinations in quick succession, he is elevated to '00' status. Following a lead to the Bahamas, he encounters Dimitrios and his girlfriend, Solange. He learns that Dimitrios is involved with Le Chiffre, banker to the world's terrorist organizations. Secret Service intelligence reveals that Le Chiffre is planning to raise money in a high-stakes poker game in Montenegro at Le Casino Royale. 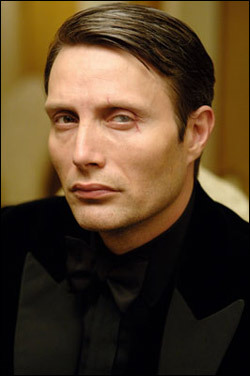 MI6 assigns 007 to play against him, knowing that if Le Chiffre loses, it will destroy his organization. 'M' places Bond under the watchful eye of the beguiling Vesper Lynd. 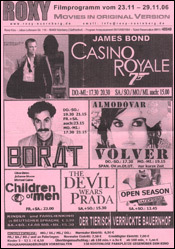 With a new Bond, a new series direction and a classic Ian Fleming novel as the backbone, Casino Royale stormed into theatres worldwide surrounded by controversy. 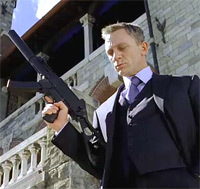 Critics and Bond fans alike lamented the casting of Daniel Craig and panned the idea of a “Bond Begins” type film. Message boards were abuzz, anti-Craig Web sites were created and it seemed everyone was ready to declare Bond dead. However, after the film's release most every critic was silenced (including this one) and the movie is now regarded as brilliant and a cornerstone of the franchise. From the moment the gritty, violent and black and white pre-title sequence begins, the audience can sense that they are in for something new and exciting. The wisecracking portrayals of Roger Moore and Pierce Brosnan have been replaced by a ruthless killer; a man capable of brutally murdering an informant in a bathroom before coldly dispatching an MI6 employee turncoat. Essentially, after a mere five minutes the audience knows that this is not their father's Bond. The first third of the movie is very action-oriented, but still takes time to develop the characters of Bond and Le Chiffre. After an intense chase through Madagascar, the movie slows down for an excellent scene involving Le Chiffre playing poker on his yacht. It is in this scene where you first get a glimpse of his cold and calculated persona, as well as his ruthless streak when he tells his henchman to show his guests out or push them overboard. Combined with his earlier dealings in Africa, Le Chiffre is a fleshed-out villain very early in the film: something a Bond film has not delivered in a long time. Of course, this movie is about James Bond's adventures: not Le chiffre's. As such, the next chunk of the film is devoted to redefining the character of James Bond. This is where the movie succeeds best of all. After 20 films and 43 years, the movie-going public has a predefined image of 007. Casino Royale manages to hold true to that while showing that Bond is much rougher around the edges than in previous incarnations. Early on there is a pivotal scene in M's flat that truly shows how different Bond is from when we last saw him in Die Another Day. In addition to the now-famous “blunt instrument” line, she spends most of the scene criticizing and berating Bond and essentially telling him if he doesn't change his ways he is not far from the cold hands of death. It felt a bit like the scene between Bond and M in GoldenEye, but with far more disdain in M's voice. After some more plot and character development scenes as well as a brilliantly staged Bondian action sequence in the Miami Airport, the film really enters classic-Bond mode. Up until this point the audience has been treated to hints of it, but when Martin Campbell slowly follows a wide angle shot of Bond's train to Montenegro traveling through the countryside nostalgia really kicks in and the audience knows they are in for a treat. Rather than quickly introduce Vesper, the film takes this opportunity to flesh out both her and Bond's characters while showing the two slowly enjoying a gourmet meal aboard a classic-looking train. 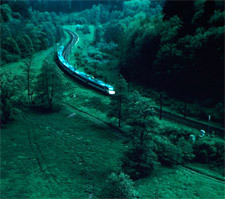 This scene was very reminiscent of From Russia With Love and is interlaced with more exterior shots of the train passing through stations. The slow-pace continues at Casino Royale with more sweeping shots of Bond and Vesper's arrival and Bond inspecting his practically gadget-free Aston Martin: a welcome change after Die Another Day's asinine invisible car. When criticizing the older Bond movies people often negatively say, “they sure did take their time.” What people don't always realize is that taking their time and developing the characters is exactly what made the early movies so great. When you rush pivotal scenes to get more explosions and chases, you often lose the heart and soul of a film. The real key is finding a satisfying mix between the two, which is where Casino Royale succeeds. Some feared that using a poker game as the movie's centerpiece was a sure-fire formula for a boring film. However, both the screenwriters and Martin Campbell rose to the task and created one of the best extended segments in Bond's long and storied history. Martin Campbell's beautiful work continues in Montenegro as the camera follows Bond walking through Casino Royale to the private table for the poker game. Once at the table, the suspense truly begins. Having both played and watched countless games of Texas Hold ‘Em, I know that it can be very exciting to play and often not so much fun to watch. However, when you combine Mads Mikkelsen's icy demeanor and few but effective lines with Daniel Craig's calculating and intense eyes and body language, the audience is truly on the edge of their seat. Interlacing the action, character development and near-death experience scenes with the well-paced poker ones shows a real sense of urgency in the marathon card game. When Bond finally does beat Le Chiffre it feels like a job well done: something that he worked long and hard for and was well deserved. With Le Chiffre bankrupted and Bond victorious, we come to the most intense scene of the movie, if not the entire series: the torture sequence. Having read the novel numerous times I knew what was coming, but I was still shocked at the brutality of the scene. Parts were truly cringe-worthy, but the film did a good job of giving a few moderately humorous lines to balance out the horror of what was being done to him. Craig and Mikkelsen's deliveries are the keys to this scene and truly make it stand out. Before getting to the finale of the film, let's take a moment to dissect Mads Mikkelsen's portrayal of Le Chiffre. While he was not a classic over-the-top megalomaniac villain a'la Blofeld or Hugo Drax, he succeeded in a way that few before him have. He was sinister – both in appearance and actions – and his line delivery was top-notch. His facial reactions of sheer shock every time Bond returned to the poker table after being seemingly “knocked out” as well as his reactions during the torture sequence quickly escalate Mikkelsen to the upper echelon of Bond baddies. Finally we get to the film's third and ultimate act...or as I like to call it: the only thing wrong with Casino Royale. As has been discussed in numerous other reviews, the relationship of Vesper and Bond was too rushed. While the movie did a bang-up job of making us believe there was sexual tension and both mutual admiration and dislike, it never made the audience believe they had fallen in love. It seemed more like constantly waking up from near-death and seeing Vesper by his side – and vice versa – was the cause of their love...not actual love. This in no way ruins the movie, but it is a major flaw. Another problem I have with the movie was the need to throw in one final action sequence: the Venice scene. It starts out brilliantly with another From Russia With Love (my favorite Bond film, BTW) homage as Bond and Vesper float into the city. However, it all goes wrong when the main baddie of the final action sequence is someone we have never met before. The glasses/eye patch guy (AKA Gettler) is introduced moments before and all of a sudden we are supposed to care about him? In Bond films the henchman often dies after the villain in the final battle, but we are usually introduced to said henchman far earlier. It would have been more effective to battle Dimitrios (were he alive) or someone we already knew rather than this unknown. Oh well, you can't have it all I guess. Mr. White. After shooting him in the leg and watching White crawl towards him and ask him who he is the camera pans up to Bond who is standing tall and ruthless with his machine gun as the Bond theme finally is played for the first time in the movie. As Daniel Craig utters “Bond, James Bond,” the theme explodes, the screen goes black and the credits roll. This one-minute segment completely makes up for all the other flaws in the third act and made me ready for Quantum of Solace right now! Well, It's official: Daniel Craig IS James Bond. He put on the tux, he said the line and he came through brilliantly! While I was not amongst the Craig-haters, I definitely was holding my breath when I went into the theater. However, by the end of the pre-title sequence Craig had already won me over. There was no acceptance-curve…he was instantly James Bond. Something about his demeanor or the look in his eyes or the way he cold-heartedly murdered the man in the bathroom made me instantly think of this man as 007. Granted he doesn't have the natural good looks of Connery or the other non-Dalton Bonds, but he was believable from minute one. Despite the lack of naked silhouettes dancing around, the title sequence works brilliantly. The entire piece felt like a moving book-cover from the earlier Bond novels. Chris Cornell's song, which I hated at first, has grown on me and works perfectly with the animation. The sequence also tells the story of Bond becoming 007 through its use of black and white and later red, which I found quite interesting. I did not, however, like how they used Craig's face. I was not a fan when it was done in the past and it still does not work for me. But aside from that, no real qualms. 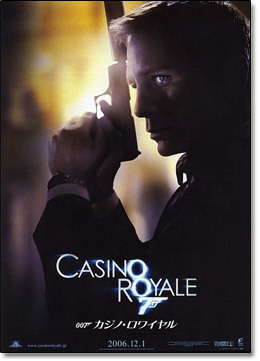 Perhaps it was only fitting that I would not be America once again when Casino Royale debuted. All my friends couldn't believe it. “Who are you and what did you do with Greg,” they all wondered. That I would not be there on opening night was inconceivable. However, I wasn't about to let a little thing like a European vacation stop me from seeing it on opening night…it just happened to be Germany's opening night. While in Nuremberg the night before the German opening day I found a little theatre with “movies in original version.” Naturally I put my sightseeing on hold and went there. Surrounded by a German audience who all spoke English, I reveled in the fact that everyone around me loved the movie and left buzzing about it. Upon my return to my hostel I immediately hopped onto the MI6 Debriefing Room and started posting in every thread I could find about the film until all of a sudden it was 2am. Oops! As the days passed and my vacation continued I couldn't stop thinking about how great the movie was. I had to see it again. Finally, my last night in Europe after a flight mixup stranded me in Amsterdam for an extra day I decided to use that time to see it again with a Dutch audience. The reaction was the same; everyone loved it and left talking about how great it was...much the same way it's been ever since. 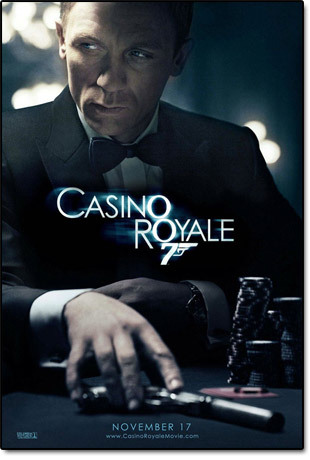 Casino Royale is also the name of the casino where Bond and Largo face-off in a video game battle in Never Say Never Again. The bond girl character name of Solange has previously appeared in two Ian Fleming stories. She was the name of the girl in OO7 In New York and a girl named Solange was referenced in From A View To A Kill. The movie's high-stakes game of Texas Holdem poker, was actually a Bacarrat game in the novel.